Polycystic Ovary Syndrome (PCOS) is a common endocrine disorder affecting many women during their reproductive years. PCOS is associated with a host of symptoms that include weight gain, irregular menstrual cycle, hirsutism, acne, and hair loss. Hair loss is due to elevated androgens known as androgenetic alopecia, or male-pattern hair loss. 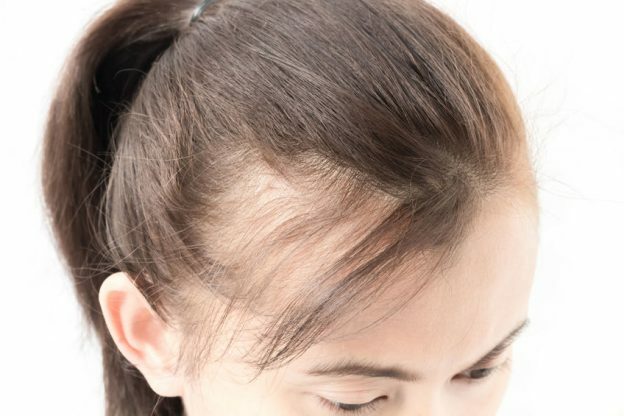 Similar patterns of hair thinning are experienced in cases of reduced estrogen, such as menopause; other disorders of androgen excess, as well as in thyroid disorders. Managing hair loss is challenging, but it is possible to slow the progression of hair loss and in some cases reverse it. The cause of PCOS is not fully known, however, many factors have been identified that may contribute to its occurrence. There does seem to be a hereditary component, and I have certainly seen this in my own practice between mothers and daughters. It is not to say that if you have PCOS your daughter will necessarily get it, but there does seem to be a higher risk. We can’t do much about our genetics, but we can influence the gene activity. Avoiding inflammation and controlling insulin are two big influencers for PCOS. Excess Insulin is linked to an increase in androgen production. Many cases of PCOS have insulin resistance, meaning their bodies don’t effectively use insulin to allow blood sugar into the cells. To compensate, the pancreas produces more insulin to try and get sugar into cells. Insulin resistance leads to diabetes, so early management of insulin resistance is necessary to avoid further health complications in the future. Insulin resistance causes elevated blood sugar, which increases inflammation. Low-grade inflammation may exist in women with PCOS irrespective of blood sugar levels, and is exacerbated by elevated blood sugar. Low-grade inflammation may cause polycystic ovaries to produce androgens. There is a definite cycle between insulin resistance, inflammation and androgens. While pharmaceutical medications and traditional herbal remedies can be used to slow and / or reverse hair loss due to excess androgens, inflammation and elevated insulin can be improved with diet modification and appropriate nutritional supplements. Following a reduced carb diet such as the Paleo Anti-inflammatory diet, or a Keto style diet helps control blood sugar levels and inflammation. For more information patients are encouraged to look into sites such as the Dietdoctor.com. Other basics include reduction of red meat, reduced dairy and ensuring a whole foods diet with a good amount of omega – 3 oils. Stress management is critical to any health care program, but particularly for androgenetic alopecia. Chronic elevated stress disrupts so many pathways including hormones and the immune system. Chronic elevated cortisol can elevate inflammation as well as increase androgens and reduce estrogen and progesterone. Chronic elevated stress will also eventual effect thyroid function and lead to reduced metabolism. Adrenal glands produce cortisol and will also secrete an increased level of the androgen DHEA along with it. While DHEA below 10 is normal for women, there is usually hair thinning in those with values above 5-6. Improved sleep, exercise, taking appropriate breaks and herbs such as ashwagandha can help manage the effects of stress and reduce cortisol. As a Doctor of Naturopathic Medicine my first inclination is not to reach for pharmaceutical medications to deal with symptoms, but in cases of Androgenetic Alopecia in women, I do. This condition can be so psychologically devastating that I seek to control it, before it gets worse. Nutrition, stress management,nutritional supplements are all part of the plan, but medical agents often are as well. One of the primary agents for PCOS related hair loss is Spironolactone, usually combined with bioidentical hormones or birth control. Progestins that are in birth control pills are not my favourite, but they can have an anti-androgen effect. I argue that bio-identical hormones will also have an anti-androgen effect, or will at least compete with the elevated level of androgens and seek to balance the lower level of female hormones. Typical dosing of Spironolactone is 100-200 mg daily in divided doses. Medications are not without side effects, so awareness and testing for potassium levels will need to be performed to ensure safety. For more sensitive patients topical formulas with hormones and spironolactone can be prescribed to minimize potential side effects. Other medications such as Berberine for sensitizing insulin receptors or metformin may be recommended to reduce insulin and thus androgens. Minoxidil and Nizarol shampoo and/ or rosemary shampoo or essential oil are part of the treatment protocol for those that can tolerate them. Minoxidil can help stimulate growth of the follicle, which is arrested by androgens, but the stimulating effect only lasts as long as the individual uses the product. This means that benefits will quickly disappear if the product is discontinued. Not everyone like the idea of being dependant on a medication or product, but the risk of continued hair loss is often a good motivator to continue use for those that have benefits. It needs to be cautioned that most medications, and or treatment plans for hair thinning take months to begin to see the benefits. This can be very frustrating for young women who are literally watching their hair wash down the drain. Understanding how the medications, natural or pharmaceutical, work is important to help keep a patient encouraged and on track. It is simply not enough to try a treatment protocol for a few weeks and hope it will work. Manageing PCOS related hair loss is challenging and takes effort and understanding from the patient and the practitioner. As a practitioner I want quick results for my pateints, but I often remind myself that hair growth is slow. Having said that, I won’t commit a patient to a treatment plan for months on end if their hair loss is worsening. There is almost always an alternative, or something that can be added to the plan to at least help slow the process. Many women come to my office hoping PRP is going to be the answer to their prayers, only to have me tell them it is not. PRP can certainly be helpful, but only if the underlying condition is being managed. When a woman presents to my office with hair loss, and her symptoms point to PCOS, I will ask for the appropriate tests to be done in order to confirm suspicions. If pateints can not get testing done through their medical practitioner, or they are not working with an endocrinologist, I will request the appropriate lab work be done through the clinic. Once a patient with PCOS is on an appropriate protocol for at least a month then PRP can be done to help encourage hair growth. Patients also need to know that one treatment of PRP is not enough. It is often only after 2-3 treatments and a minimum of three months after treatments have begun, that patients see a thickening of their hair. If PRP is not helping patients then it is an indication that the underlying condition is not well controlled. If a patient suspects they have PCOS then tests such as estrogen, progesterone, fasting blood glucose, free testosterone and DHEA should all be performed prior to an office appointment, if possible. It is also worthwhile to have a thyroid panel (which includes free T4, Free T3 and TPO), ferritin, morning cortisol and Vitamin D tested to rule other factors affecting hair. I am quite adamant about looking for an underlying cause of hair loss if I suspect one. I know I have frustrated a few patients by asking for various tests prior to accepting them as a candidate for PRP treatment, but I believe, this is also the trait of a practitioner who is truly interested in positive results for the patient.